How ad-hoc teams could work like companies, improving their workflow and collaboration standards. What the 7 things are that every team on a planet needs to have to operate efficiently. Why John Furneaux, CEO of Hive, doesn’t believe in big organisations as a smart way to achieve goals. What the most insane competitive advantage is that any company can gain if they reinvent themselves in terms of team collaboration. ‘Deadly simple to onboard, intuitive to use, easy to set up, easy to master’. ‘It’s saving us hours of time each week from making our lives easier around workflow, task management and reporting’. I hope the message from the above quotes is clear. Yep, there is an upstart in the market of collaboration and project management tools, eager to take on the household names: Microsoft, Google, Slack, Asana, and Atlassian (Trello and Jira). Hive app designed by Netguru - see our case study on Behance. Hive, labelled by its founders as ‘a secret child of Asana and Trello’, has already attracted the likes of Starbucks, Samsung, WeWork, and The Economist to its powerful collaboration platform. Founded in 2015 by ex-Oracle and ex-Huddle staff, Hive raised over $5m in funding so far. Last year, the customer base grew by 100% monthly, reaching over 2,000 enterprises. Hive enabled multiple teams to cut down on emails, improve tracking and planning cycles, or break silos. 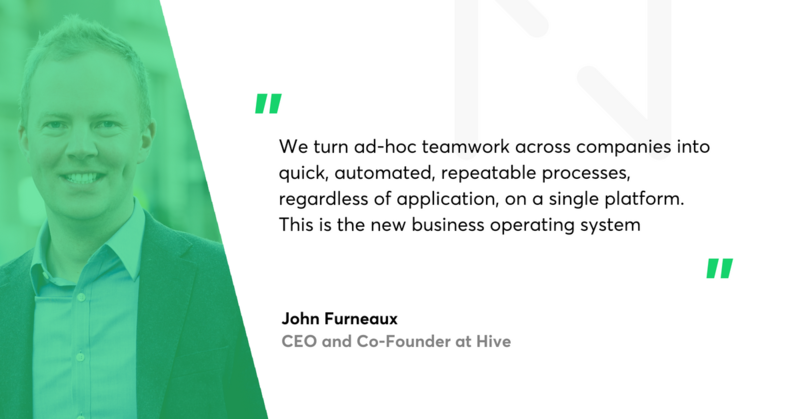 Not only did Hive integrate communications, but it also implemented machine learning to notify users about overdue projects, resourcing, and bottlenecks proactively. I was fortunate enough to interview John Furneaux, CEO and one of the masterminds behind Hive. But before I hand over the narrative to him, let me smuggle the message: ‘As a design and software partner for Hive, Netguru is super-proud of all the feedback the platform has received so far. Such feedback as “clean, great UI’ gives us goosebumps every time’. If you’re interested in our collaboration with Hive, read the case study. Tomasz Grynkiewicz, Netguru: What was the trigger that made you think: it’s time to stand against some big names in the productivity market? 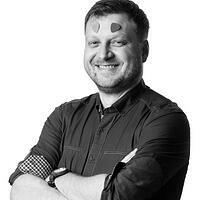 John Furneaux, CEO at Hive: I’ve been an absolute collaboration nerd ever since college. I started working with multinational companies, first at Capgemini, then at Huddle, where I became the global leader of the customer success team. I was dealing with teams from various companies on a daily basis. What I found was that there were universal problems with teamwork and collaboration, and they were completely unsolved. If they were still unsolved, we wouldn’t have witnessed such growth in collaboration industry. If you look at things like SharePoint, Asana or Jira, none of them were solving the problems. The teams I was dealing with were asking for a very straightforward solution. But the big players weren’t providing that. Can you be more specific about the features that were lacking on the market? So I have seven principles that most teams and I want, from large multinationals to small companies. I want to share a file with the person sitting next to me. I want to send a message to my colleague. I want to see what I've got to do today. I want to see my team has to do today. I want to see work that is behind schedule. I want to know what we did this week. I want to know what we need to do next week. That's the seven things that I need on a daily basis, and I have found teams large and small have the same requirements. One example - why does Asana not work for me? Well, what if I want to send a message to my colleague? Nope, can’t do that. I’m stuck; I need to use tools like Slack or HipChat for that. Second example: I want to share files with a person sitting next to me. Whoops, sorry, can’t do that. I need to find another tool for that. Let's take Slack or HipChat. I want to see what team is working on. Nope. Can’t do that. Need to find Asana or Basecamp, or anything else. These seven things people need are typical for everybody. It just feels right we should be able to do these seven things in one app. Why do we need three different tools for that? And that’s why Hive was started. What is the value Hive is adding to the world of teamwork? Three things: ownership, time bound delivery, and measurable output. Ownership is one of the biggest issues that teams get wrong most of the time. They fail to allocate specific ownership for each thing they are doing. We’ve all been in this meeting when someone says: “We need to have a guideline document that helps us run our Salesforce”. Everybody goes “yeah, yeah, yeah, terrific idea”. And then we meet the week after and the document is nowhere to be seen. And it’s week after week, no job done. Tools like Hive, Jira or Asana show who’s in charge of any action and who’s going to be in trouble if the task is not completed. Similar story. If we agree on the action without setting a deadline, we will waste weeks before we get anywhere near the project. On Hive, if we decide on a specific deadline, let’s say next Tuesday, I know that the day after Tuesday Hive will send a message with all overdue tasks to all of our team. We don't need to chase it because nobody wants to be on that list. It makes us look unprofessional, and we won’t look good in front of our peers. So we are self-motivated to keep up with the things we need to do. So it is the app that applies the pressure? I feel that it is a healthy and non-angry way to keeps all of us accountable and stick to the times we said we do stuff. No one likes to be in an uncomfortable conversation. In the book “How to Win Friends and Influence People” Dale Carnegie argues that stick is almost entirely ineffective. Unless you’re in a kind of a war zone, people primarily respond to positive feedback. And I believe that tools like Hive allow people to excel by removing some of those needs for negative feedback. Let’s focus on the industry for a moment. What trends might shape the future of collaboration and help you grow? First, borders are disappearing. They are breaking down as there are tools allowing us do work effectively, even with remote developers or designers, like Netguru in our case. I think tools like video conferencing, task management, communication platforms will become even more important as a trend continues. I also believe in a more significant trend: that in 20 years a big corporation will be less and less common. I don't believe big corporations are a smart way of achieving goals. We're continuously getting better at working across companies. It will be more common that a company like Hive will be a tight small group of people who are drawing on specialists for different tasks and projects. I believe there is a massive wastage in a business where you are carrying people full time, when what you actually need is a specialism at the right moments. If you could provide with an example? Do I need to have 3 SEO specialists on my payroll every single day? Not really. What I want to get is a company that specialises in SEO and use them for 10 hours a month or week. Let's compare this to our work with Netguru – I don't need to have specialists covering every aspect of technology we need for Hive. I can go to the market and hire someone who has had experience with what I need. We want someone who is excellent at the moment we need them, and that's why I believe that companies will increasingly work with other partners to deliver specialisms. To do that effectively, they need to work as if they’re in the same company. And tools like Hive help us do that. If you add the millennial trend in the workplaces, I firmly believe remote work will become a thing. We will see an increasing number of employees who live in Bali and do social media for a company in the UK or live in Australia and do marketing for a company in Sweden. Therefore, if you want to hire the best, you have to have an environment where they can work remotely successfully. Technology will catch up shortly to close that final gap to allow us to feel on a teleconference call as if we’ve met in real life. As the technology gets better, all of this sense of light, body language and relationship building, will become possible. What is your strategy for, let’s say, the next three or five years? What will happen in the market? I believe that in the very short term, over the next five years, we will see a complete sea change. I feel I need to make a brief retrospective on that. So think about 1970. And now think about you are working for Nike at that time, and you are trying to make right decisions about what stock you have. In 1970, I would have absolutely no freakin’ idea how many shoes I have in my factory in New Jersey. And suddenly we bring things like SAP, Oracle, and I can see with high precision how much stock and raw materials I have, how many shoes I've made, where they are and where they're needed. A few years forward, I work in a sales department. I have some idea of the sales I've done, mostly coming from quarterly reports. So I can see that my company sold more of this product and less of that product in the last quarter. And then along comes Salesforce, and, suddenly, I can see it in real time: what's selling well and what’s selling poorly. Therefore, I can make changes to my approach fast. What is the connection of that story with Hive and collaborative tools? That it is absolutely crazy that in 2018 I have no idea what my people are doing today, what they are going to do tomorrow, and what they did yesterday. And if you think about a big forward-thinking organisation, like Microsoft or Uber, you would understand what potential is there waiting to be unlocked. What might this sea change look like? Imagine workers come to work. Things that they need to do today will be visible to them, but they will also be transparent to the team around, to the team leader, to their colleagues and up to the management. The corporations who realise that first will have the most insane competitive advantage to everybody else. So what you are suggesting is that, suddenly, it will be like turning the lights on? If you can see what everybody is doing, you will know where the inefficiencies are. You will see people who are lazy. We all know the corporations have people who sit there and do nothing, as if they were forgotten. So, suddenly, we will be able to see things about our most expensive and most valuable asset: our people. "Oh, that's what they're doing! That's why this project is delayed. That's why this team outperforms". So why have we fallen short on this so far? Because we lacked two things - tools and interoperable standards. Nobody lives in an email app; nobody lives in Asana. To run a team smoothly, you need one comprehensive tool to integrate messaging, planning, and execution. Hive helps with that, so you can see with great precision why things are going well or poorly. With Hive analytics, you can see ahead of time that this project is going to go overdue next month. Then you can take actions and fix that problem before it even happens. If I get you correctly, the lack of interoperability could impact that vision? We would advance significantly if we all could agree on what – from the perspective of programming code and algorithms – our job looks like. If we could agree on some basic stuff, then, suddenly, Zendesk, Salesforce, Hive, Jira, and even some safety systems – all applications would start talking to each other, and then we could pass around the tasks between tools seamlessly. We've achieved that level of interoperability with email systems. The technology is here. The time is now; the apple is waiting to be eaten. Fingers crossed. You’ve already mentioned Netguru’s part in developing Hive. What value did we add to your project? The difference between Netguru and other companies with which we have worked so far is that Netguru is good at taking the ownership. I appreciate that approach a lot, because what we need is to ask for an outcome and have someone deliver it on a given timeline, without us requiring to try to help in every step in a way. That means we’re not adding management overhead on our side. I appreciate the PM model that you have, not just the software development and design. The second thing that I appreciate about Netguru is your modern design and focus on quality. What made you decide for Netguru? As we were looking for a partner, we downloaded tons of apps from each of the providers that we got the quotes from. Netguru emerged as the top choice concerning quality. At the same time, it was the most expensive choice. We got several quotes that were half or less cost Netguru estimated, but when we looked at the job to be done, the Netguru offer was closest to what we thought was the reality. It was a positive sign for us. To make right planning decisions, we need predictability; thus we want to be given honest answers.